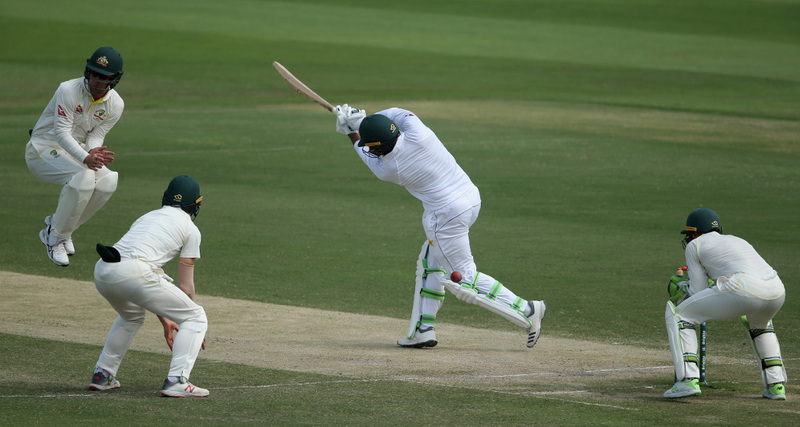 Pakistan tightened their grip on the second Test against Australia in Abu Dhabi Thursday as they reached 232-4 at lunch, in a morning marked by a bizarre run out of Azhar Ali. At the break on the third day, Asad Shafiq was unbeaten on 42 and with him Babar Azam on 34 not out as Pakistan’s overall lead reached 369 with six wickets intact. Play was dull to begin with, but was lit up by Azhar’s embarrassing dismissal. The batsman edged a Peter Siddle delivery to the third man boundary and thinking the ball had crossed the rope, halted in the middle of the pitch to talk to fellow batsman Safiq. But Mitchell Starc picked the ball a yard from the boundary and threw it back to wicketkeeper Tim Paine, who ran Azhar out, leaving the Pakistani duo — who have a combined experience of 130 Tests and over 9,000 runs — looking stunned and sheepish. Lyon has figures of 2-97.